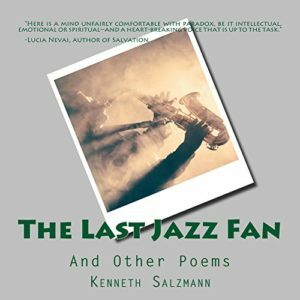 Today, Feathered Quill reviewer Ellen Feld is talking with Kenneth Salzmann, the author of The Last Jazz Fan. FQ: Tell our readers a little about yourself. Your background, your interests, and how this led to writing a book? SALZMANN: I have been a writer—of one thing or another—for virtually my entire life, which at this point means for quite a few years. My first “published works” appeared when I was in the sixth and seventh grades in some trade magazines my father published, essentially rewritten press releases, as I recall. In the years since, more than 50 of them, I’ve never not written, for both professional and personal reasons. That includes everything from seemingly countless newspaper and magazine articles and columns to freelance assignments ranging from speeches, web and blog content, scriptwriting, press releases, ghostwriting, marketing materials, ads, and more. During much of this time I have also been active in small press literary publishing and programming, both as a presenter of emerging and acclaimed writers and as a practicing poet myself. In that regard, The Last Jazz Fan and Other Poems is really a continuation of something I have always done and always valued. FQ: Tell us a little about your book – a brief synopsis and what makes your book unique. SALZMANN: I suppose that every book of poetry is unique, simply by virtue of the nature of the genre. Poetry is the distillation of experience (perhaps real, perhaps imagined) and an effort to burrow beneath its surface, and no two writers will live in the world or report their findings in quite the same way. The Last Jazz Fan and Other Poems is my most recent attempt at that, including primarily recent poems while also resurrecting some older ones that still resonate for me—and, I hope, for the reader. It pleases me that the reviews of the book have been quite positive and that such notable writers as Marge Piercy—whose juried intensive poetry workshop I was fortunate to be a part of a few years ago—have praised it. She’s a famously tough critic, so it’s more than gratifying when she writes that “Salzmann is a rare poet who can draft excellent and moving poems” about a range of topics. FQ: Please give our readers a little insight into your writing process. Do you set aside a certain time each day to write, only write when the desire to write surfaces, or ...? SALZMANN: I’ve seen the quote attributed to a number of different people (maybe it was the composer John Cage or maybe it was Pablo Picasso or maybe someone else), but someone said something like, “I only work when I am inspired, but fortunately I am inspired every day at 9:00 a.m.” Anyone who has written for a paycheck will appreciate the sentiment, I think. Most of my work over the years has been for paying clients, but I find that even writing a poem requires the same sort of discipline. I may not write poetry as frequently as other pieces, but when I do I approach it as I would, say, a deadline article and turn myself over to the hard work of writing a poem good enough (I hope) to send out into the world. FQ: Which do you find easier, starting a story, or writing the conclusion? SALZMANN: This is another way in which, at least for me, writing a poem mirrors writing a conventional piece of prose. That is, I spend maybe an inordinate amount of time on the beginning, whether that means a line or image of a poem or the first sentence(s) of a newspaper article, what journalists refer to as the lead, generally written as “lede” to avoid confusion with the lead type that newspapers once used. When I was a reporter, I always felt that when I had nailed the lede the rest of the story would fall into place. In poetry, most of my work begins with that single line or image that leads me into the sort of exploration that writing a poem is. The main difference is that sometimes it turns out that what seemed to be the first line of a poem turns out to work better elsewhere in the piece, maybe even as the last line. My poem Tango Lessons is an example of that. Instead of beginning with the image of “Death” as a beautiful dancing woman (an image borrowed from a dream a dying friend told me about), the poem ends on that note. The book’s title poem, The Last Jazz Fan, is an example of the more straightforward approach, where the organizing conceit gives me the first line. FQ: As an author/writer, what famous author (living or dead), would you like to have dinner with, and why? SALZMANN: One of the great pleasures and privileges I’ve had both in working for literary organizations and as a reporter interviewing “newsworthy” people is the chance to meet, and often “have dinner with,” any number of writers I admire. I did hold myself to a rule for those sessions, however. Prominent writers often earn a considerable portion of their livelihood doing readings and other public appearances, and they are regularly subjected to social events with hosts jockeying for attention and trying to impress them with their own literary achievements or knowledge. I wanted to give the authors and break from that, and keep the conversation mostly away from books and writing and take the occasion to get to know them a bit as people, not Great Writers. FQ: How much research went into writing your book? SALZMANN: I suppose most readers don’t think of poetry as writing built on research, but the reality is that poetry requires specificity and, quite often, that need for specificity requires some research to achieve the precision that makes for a good poem. The Last Jazz Fan and Other Poems is full of poems I couldn’t have written without educating myself further about one topic of another. My poem From the Copper Canyon Train is certainly one of those. In it I write about an encounter with an indigenous people living in Mexico’s immense Copper Canyon much as they have lived for centuries, in some cases in caves in the canyon walls. To write about them, I had to learn more about their history and culture than I could glean from the few days I spent near them. Similarly, in The Poem I Have Yet to Write I wanted to incorporate a “burning bush” metaphor, but to do so somewhat obliquely. That required me to sift through the many botanical and popular names for the shrub that’s often called Burning Bush and find an alternate name that had both the metaphorical value and musical facets of the more common name. FQ: Have you done any presentations in your field at conferences, etc.? SALZMANN: Like most poets, I imagine, I do readings when I have the opportunity. That, after all, is where poets and readers can really connect, and where the poet can begin to build an audience for his or her books, one reader at a time. Changing hats from solitary writer to public performer can sometimes be challenging but there’s no better way to get one’s poetry out into the world.